As the 2nd largest state in Peninsular Malaysia, Perak has several places of interests that captured the visitors from local and oversea. The capital of Perak is Ipoh, it is once a town that is well known for its tin-mining activity. Other than sightseeing, there are lots of great foods in Perak as well. Ipoh Kuey Teow is a significant dish here in Ipoh, Perak. You are not to leave Ipoh without trying one. Kuey Teow is a type of white flat noodle and Ipoh especially famous for its extra smooth and fine noodle texture. It is served with soup and shredded chicken meat and bean sprouts. You can get a good bowl of Ipoh Kuey Teow at House of Mirrors (Thean Chun) Coffee Shop at Jalan Bandar Timah, Ipoh Old Town. Most of the satays around Malaysia are of chicken, beef or mutton. Visitors will be able to try the pork satay here in Perak. The juicy pork meat marinated in special sauce and barbequed over charcoal smells wonderful even from miles away and it is so enjoyable when eat it together with the spicy peanut sauce provided. You may try this at Kong Heng Coffee Shop at Jalan Bandar Timah, Ipoh Old Town. 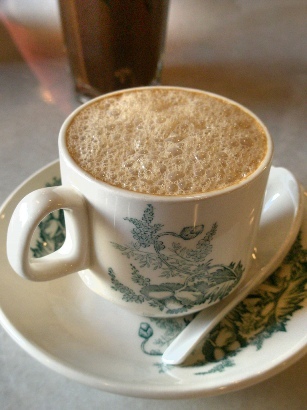 Another signature drink from Ipoh would be the White Coffee. It is so thick and rich that you will keep ordering this every time you sit down for a meal. The coffee is made with coffee beans roasted in palm-oil margarine making and then mix together with condensed milk. It is a must try for all visitors. Do come by Kedai Kopi Sin Yoon Loong, located at Ipoh Old Town for a cup of white coffee during your visit here. You will not be disappointed. The Curry Noodle is so rich and flavorful with the aromatic curry soup added with creamy coconut milk. There is roasted pork with a very tender texture and it is a definite must try dish here in Perak. You have to be early and be prepared for a queue if you are visiting during the weekend at Sun Seng Fatt, Jalan Market, Ipoh Old Town which serves one of the best curry noodles here. Chee Cheong Fun is a Chinese dish where rice noodle rolls wrapped with pork or prawn meat and served with special sauce, fried shallots and toasted sesame seeds. It is a mouth-watering dish well known here and you will surely ask for more. You can try some at Pasir Pinji Chee Cheong Fun at Jalan Pasir Pinji 5, Ipoh.